« Does Your OS Support Your Camera? Nikon V2 — Surprisingly, the body bulk (other than the grip) is a bit smaller than the V1. I wasn't exactly expecting Nikon to downsize anything, but they did. That makes the EVF hump more pronounced, especially since the accessory shoe moved up top of it and there's a small built-in flash now. In terms of handling, things are better than the V1. A real mode dial that doesn't move easily. A command dial where Nikon users expect it. Menu fixes (and terminology changes). Unfortunately, oddities still exist. The way the function button works in PASM mode is different than Auto mode, for example, and neither are programmable. The AF Assist lamp is buried deep behind the grip where your fingers and lens hood will block it. The EVF stutters while panning unless you partially press the shutter release. Bottom line: Nikon addressed a lot of issues, but raised new ones. Overall, it's two steps forward, one backward. Image quality hasn't impressed me yet, though we're still waiting for more raw support to appear so that I can compare workflows directly. There's only about a 20% increase in resolution implied by the sensor change. But we're also talking about a reasonably small sensor to start with, so we almost certainly lost light collection area. I believe I can see direct one-for-one tradeoffs in the more pixels versus dynamic range comparison. But I'm still testing. Suffice it to say that there isn't a dramatic image quality difference. The big issue, of course, is that a V1 is going for US$300 or so at the moment while the V2 is US$850 here in the US. Are the handling and image quality changes enough to justify paying 1.8x more? In my initial assessment, my answer would be no. The V2 is just as overpriced on launch as the V1 was, in my opinion. 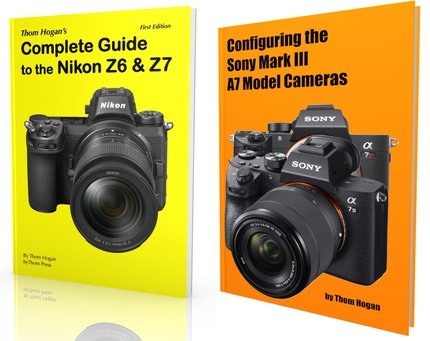 That doesn't make it a bad camera, but why Nikon continues to think that their incomplete Nikon 1 system is worth more than other mirrorless systems, I don't know. The V2 is not a camera I'd rush into buying. Fujifilm X-E1 — Here's an easier situation to describe. The X-E1 has the same sensor, same image quality, same autofocus performance, same controls, and so on, as the X-Pro1. The current difference in price is US$400 between the two, though Fujifilm has been tinkering with discounts lately so that might not stay accurate for long. For the extra US$400 you get a bigger body, slightly (and I mean slightly) better body build, and a viewfinder that can change from optical to EVF view on demand. Not much else changes (though the X-E1 has a slightly better EVF). Image quality is exactly the same. As close to identical as you can get within sample variation, I think. So the X-Trans sensor issues I noted in my X-Pro1 review are still there, but so too is the Fujifilm JPEG color and quality that some love. Thus, if you're interested in the X-E1 just read my X-Pro1 review and ignore my comments about the optical side of the hybrid viewfinder. Also, the focus system has been improved since I wrote that article (available as a firmware update to X-Pro1 users). The only other thing you'd have to do is compare the two bodies in size/shape. From my standpoint, I've found that I use the optical viewfinder less and less, thus the X-E1's slightly smaller size and lower price is appealing to me. These cameras are near identical twins, so you buy one or the other for very small differences (other than price). Sony NEX-6 — I have to admit, I'm really liking the NEX-6. It has many of the best attributes of the NEX-5 (16mp sensor, etc. ), many of the best attributes of the NEX-7 (EVF), and adds some new interesting bits like hybrid autofocus, WiFi, and programmability into the mix. It also seems a better match to the current state of E-mount lenses, too: the extra sampling of the NEX-7's 24mp sensor just tends to be more revealing of edge and corner issues. Of course, those issues are still there on the NEX-5 and NEX-6, but there's just not as much sampling to make that as disappointing to me as it has been on the NEX-7. Note that I used the words "better match." The existing Sony lenses on the NEX-6 produce very nice images, and the lower sampling helps mask lens issues a bit. Handling is a little more straightforward (and a tiny bit more traditional) on the NEX-6 than either the NEX-5 and NEX-7. It seems that each generation of NEX has Sony getting a little bit more refinement and balance in the external controls. Menus are still a mess, though. Image quality is good. Quite good. Take a look at my NEX-5 review and mix in just a teeny bit of refinement on the JPEG side and you'll get a fair idea of what I'm seeing in my early testing of the NEX-6. The 16mp Sony APS sensor has always been a top performer, and that appears to be true on the NEX-6, as well. The body-only price is a bit steep considering all the options on the market (though it's currently the same price as the Nikon V2 with the simple kit lens, which is another reason why I say the V2 is overpriced). But the NEX-6 with 16-50mm compact zoom lens price is closer to "right," and that's proving to be an interesting combination. Remember, these are just preliminary observations. I'll have much more to say (though I hope I won't be taking anything back) when my final reviews are done. One final comment: I'm not entirely sure what happens after Christmas, but my sense is that camera sales are soft enough that sales and rebates will likely be common in early 2013. Japan and Europe are in recession, camera sales overall have declined in the lower models and flattened in the higher models, and there's a lot of mirrorless inventory out there.